Primo the Doberman Pinscher at 18 months old doing his regular guarding chores. Loves his daily walk and playing with his favorite toys. The Doberman Pinscher is a medium sized, squarely built dog with a compact, muscular body. The head is long and when viewed from the side, looks like a blunt wedge. The top of the skull is flat, and turns into the muzzle with a slight stop. The color of the nose depends on the color of the dog's coat; black on black dogs, dark brown on red dogs, dark gray on blue dogs, dark tan on fawn dogs and pink on white dogs. The teeth meet in a scissors bite. The color of the almond-shaped eyes is various shades of brown, depending on the coat color of the dog. In the USA ears are usually cropped to stand erect (cut at the age of about 12 weeks). The pup's ears have to be taped for a couple of months to make them stand up. A lot of breeders are starting to leave the pup's ears natural. If left natural they develop ears somewhat like a hound. The tail is usually docked at the age of 3 days. If the tail is not docked it grows a tail somewhat like a hound. Note: cropping ears and docking tails is illegal in a lot of countries and we are starting to see more and more dogs with their body parts left in tact. The chest is broad and the legs are perfectly straight. Dewclaws are sometimes removed. The short, hard, thick coat lies flat. Sometimes there is an invisible gray undercoat on the neck. The coat comes in black, black with tan markings, blue-gray, red, fawn and white. When markings appear they are above each eye, on the muzzle, throat, forechest, legs, feet and on the tail. There is also a solid white color. While white markings are considered a fault in some clubs, in others they are accepted. 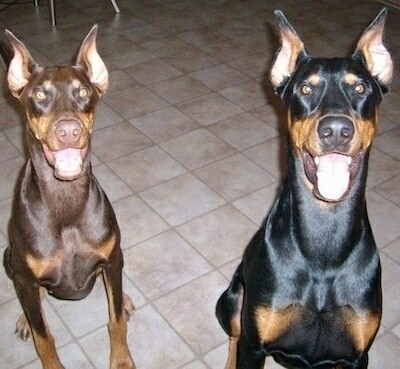 Doberman Pinschers are very keen, super energetic with tremendous strength and stamina. Dobes like to be with their people and are not suited to kennel or backyard life; they need human interaction and leadership. Loyal, tolerant, dedicated and affectionate with the family. Determined, bold and assertive while working, they are very adaptable, highly skilled and versatile. They are intelligent and very easy to train. They are an outstanding watch and guard dog and do not need additional protection training. This breed is not for everyone. 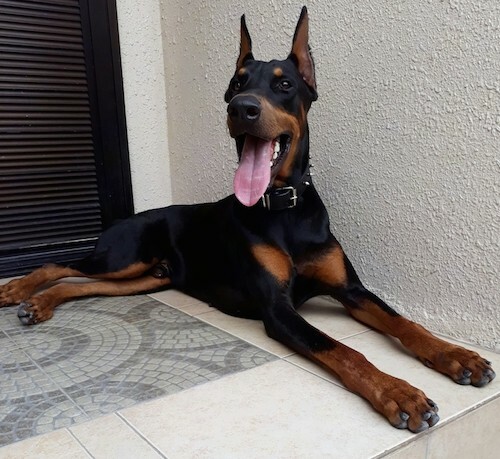 The Doberman needs an owner who is willing and able to display a natural authority over the dog. All family members must be firm, confident and consistent, setting rules and sticking to them. Learn to handle the dog properly, as Dobermans can become stubborn and willful if allowed to have their own way. Everything must be on the human’s terms. The dog is the follower, and the humans are the leaders. The dog will appreciate knowing his place in his pack and feel secure about it. He should be thoroughly socialized when young to prevent skittishness. Mental stimulation and a lot of daily exercise are important in order to produce a happy, stable-minded Dobe. The Doberman needs to be consistently and thoroughly trained. Dobes can be good family dogs if the alpha role belongs to the human and if they receive enough exercise, are well trained and are socialized with children. Although the Doberman has the reputation of being a very aggressive dog, this is just not the case. For example, Dobes make great therapy dogs. Issues arise when they reside with owners who do not display the proper leadership and/or do not provide enough exercise. They are sweet and gentle with nursing-home patients—tippy-toeing over IV tubing and walking at the resident's speed (which can be very slow), while at the same time will fiercely defend their masters if it becomes necessary. 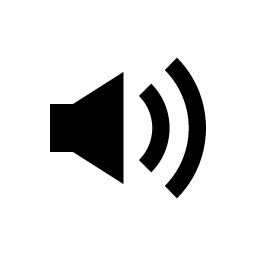 Dominancy levels vary, even within the same litter and the breed’s temperament will vary greatly depending on how well the owners understand canine behavior and how willing they are to take the time to provide what the dog instinctually needs. 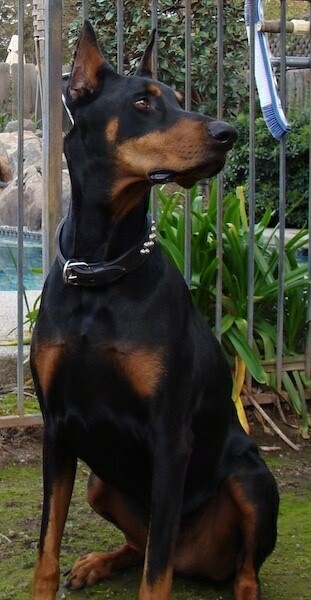 A "Warlock" Doberman is a term given to Dobermans which are larger than the standard size the kennel clubs have placed on the breed. Prone to possible cervical spondylitis (wobbler syndrome) due to fusion of neck vertebrae and compression of spinal cord; possible inherited blood disorder (Von Willebrands disease); obesity in middle age. Also prone to skin issues, bloat, hip dysplasia and congenital heart defects. The gene which produces the albino (white) Doberman is said to be the same gene which produced the famous white tigers and lions owned by Siegfried & Roy in Las Vegas. Some also believe the gene is a masking gene, meaning it "takes over" and masks the color that the dog would be otherwise. White Dobe fanciers say there is no evidence that this gene carries with it any deleterious or adverse health concerns that are sometimes associated with other white animals such as deafness, blindness or unstable minds. Some breeders beg to differ, claiming the gene does cause health issues. Will do okay in an apartment if sufficiently exercised, but does best with at least an average-sized yard. Dobes are very cold sensitive and are not outside dogs. That is why police in areas where it gets cold are not able to use them. 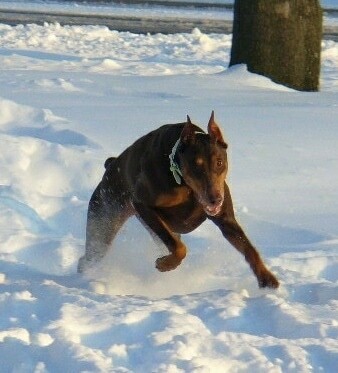 The Doberman is very energetic, with great stamina. They need to be taken on a daily, long walk or jog, and need to be made to heel beside or behind the human holding the lead, as in a dog's mind the leader leads the way and that leader needs to be the humans. Dobes need little grooming and are average shedders. This is a breed of relatively recent origin. It was developed in Germany in the 1860s, presumably by crossing among the old shorthaired shepherds, German Pinschers, Rottweilers, Beaucerons, Manchester Terriers and Greyhounds. The creator of this mixture was a German tax collector named Louis Dobermann. Dobermann had to travel frequently through bandit-infested areas, and decided to develop a watchdog and bodyguard capable of handling any situation that might arise. The breed is named after its originator (shortened by one n). The Doberman was first presented at a dog show in 1876. It was immediately a big success. The Doberman was first recognized by the AKC in 1908. 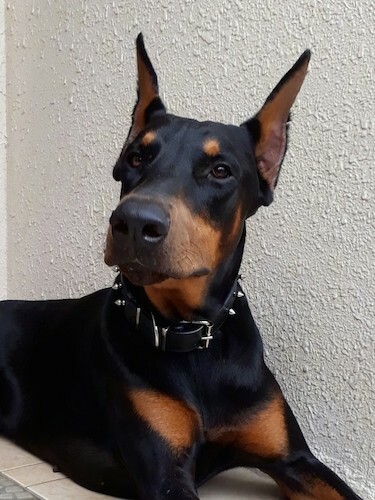 Doberman Pinschers have many talents including tracking, watchdog, guarding, police work, military work, search and rescue, therapy work, competitive obedience and Schutzhund. "This is my Dobe puppy named Sara. Her coloring is blue. She is so sweet." 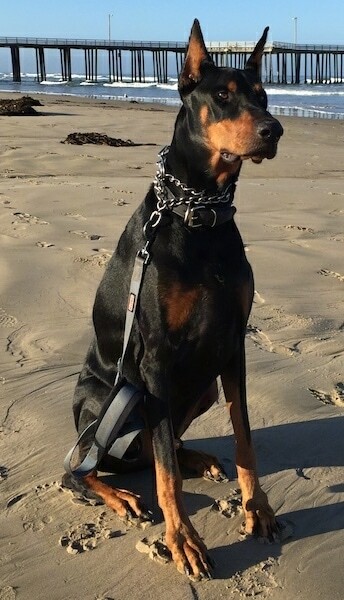 Rommel the Doberman Pinscher from Australia at 18 months old—"Rommel can be found snatching socks, parading around the yard and peeking through fences. He loves nothing more than spending time with people and lets you know when he wants to play by nuzzling toys on your leg or dropping them into your lap." 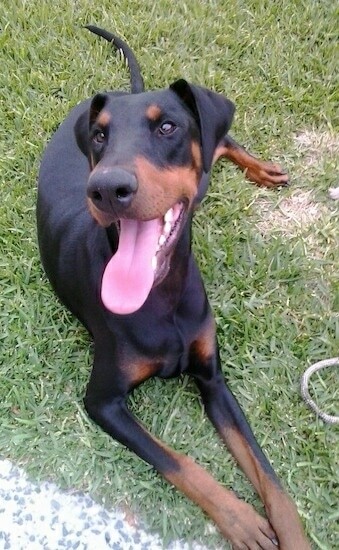 "Deevo the Doberman Pinscher at 9 months old is shy until he gets to know you, then he will be jumping all over you. He likes to go for walks, run around the beach, and to play with other people’s dogs (very friendly). He hates when they stop playing with him to relax or rest. Every once in a while he will dig a hole, happens rarely. Rarely barks, never tries to run after other dogs, always sticks to me wherever I go around the house, he never leaves my sight. 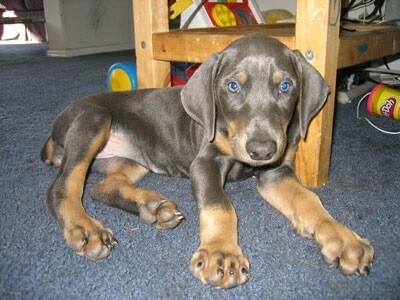 Doberman are not aggressive as many people say, no dog is born aggressive; they are created." 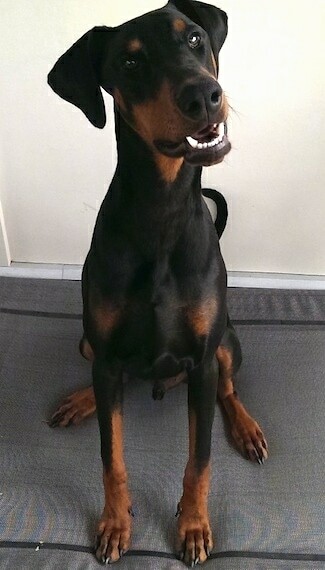 "Max the Doberman Pinscher from Norway at 5 years old and 72 cm. (28 inches) and 42 kilos (92 pounds)." 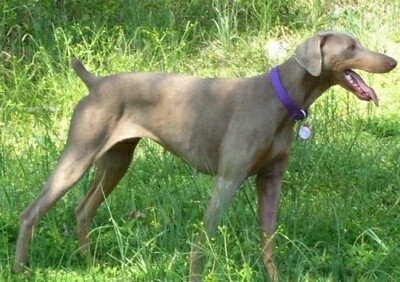 Max is an example of a Doberman with a natural tail and ears. They have not been cropped or docked. "This is Ginger at almost 3 years old. She is a fawn/rust Doberman and is a great dog, super loving and gentle. She loves playing with my 3-year-old cousin and 1-year-old niece." 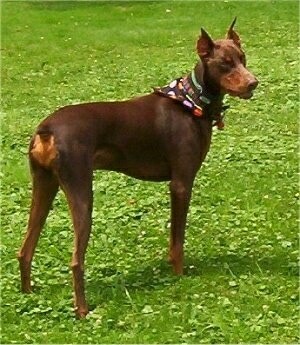 "Tia is a red Doberman female that is 8 years old. She is a 69-pound lap dog. Any chance to get close to people she is right there unless you are using power tools or the vacuum. She loves to play in the snow and chase squirrels. Overall, she has been in very good health with minimal hip problems. She plays too hard at times and limps for a while. We learned from watching The Dog Whisperer that we were not exercising her enough, so we started walking her 5 days a week. It has really helped with her hips." 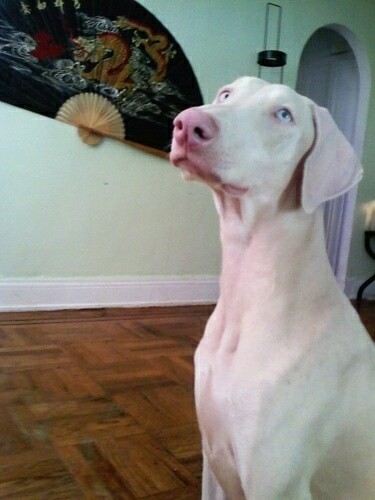 Vera the white Doberman Pinscher—"This is my lovely Vera. She's starting to mature, and acting less like a puppy. In the picture Vera is 11 months old. Her temperament is great, very playful with everybody, but if she senses danger she gives a back-off growl." 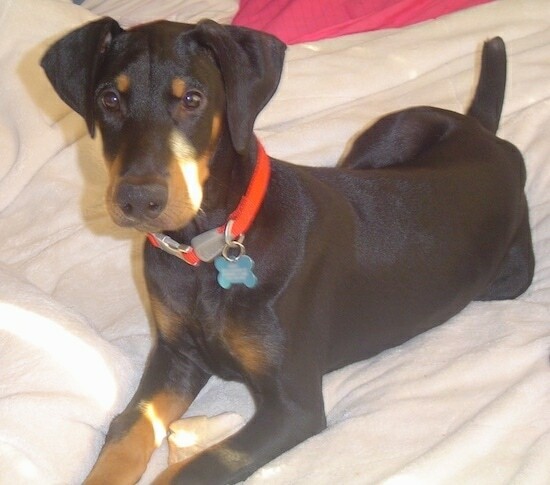 "Titan is a 3 and 1/2 year old black and tan male Doberman weighing 101 pounds. He loves to play fetch at the park every morning rain or shine. He can catch the balls occasionally before they hit the ground. He can fit 3 tennis balls in his mouth at once. He almost always either has a ball or toy in his mouth or is chewing on something. The kids playing at the park love to come up to pet him and he is very gentle and patient with them. He's very prey driven and loves to hunt and chase rats, squirrels, cats and remote control cars. He does not like things flying in the air such as kites, hot air balloons, remote control airplanes and larger birds like crows and hawks. I think he partially gets his good looks from his grandfather who was a show dog. Unfortunately his aunt died of DCM and his mother died from it and was resuscitated. I hope he does not have it and that I have many more great years with my boy."